Grow your very own butterflies and watch the entire magical process from egg, to caterpillar, through metamorphosis, and finally to adult butterfly all in your own backyard by planting these butterfly host plants like Passionvine, Butterfly Weed, Fennel, Hibiscus, and more! An unusual conversation starting Milkweed that is eagerly consumed by caterpillars of Monarchs, Queens, and possibly Soldier butterflies. Balloon Milkweed is a vigorous heat and sun loving tropical African shrub that is grown as a dieback perennial except in areas with mild winter climates. It produces clusters of 1/2" wide cream to white star shaped flowers with a purplish 'eye' and the flowers attract butterflies along with a variety of other pollinators. 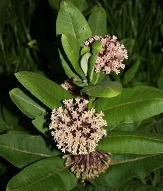 Balloon Milkweed is adaptable to a wind range of soil types as long as they are well-drained and is moderately drought resistant once well established. Item# 10974. The dark colored purplish-bronze finely textured foliage makes a beautiful addition to the perennial border or the butterfly garden. Mix it with Golden Delicious Pineapple Sage or other yellow foliaged and flowering plants for a great combination. Item #9121. Tall spikes of dark golden yellow 1" blooms are born in summer and fall on an upright growing shrub. Called Popcorn Cassia because when brushed or crushed the foliage emits the wonderful fragrance of freshly buttered popcorn. Item# 9018. Climbing Milkweed is a vigorous vine easily reaching 15' under good conditions. 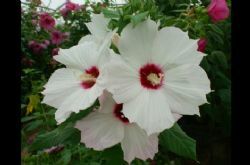 It produces large clusters of white flowers sometimes tinged with pink or purple that attract a variety of pollinators. 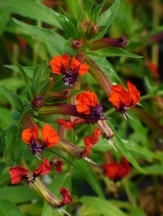 This is a taprooted perennial and is sometimes considered a pest that is difficult to eradicate once established. Item# 10673. Large clusters of star-shaped of purplish pink flowers are borne in summer among the large, tropical looking, somewhat gray-green foliage. This root hardy native perennial will often develop into a colony of plants spreading by underground rhizomes as well as reseeding. 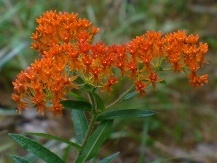 Common Milkweed is native to the eastern 2/3's of the US as well as occurring in WA, MT, and Canada and is considered by many to be one of the most important milkweed species for the regal Monarch butterfly. Item# 10162. 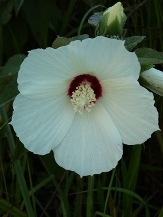 The dwarf form of it's much larger cousin and native to the sandy and sandy loam soils of much of the southeast US. The Dwarf Pawpaw produces 3-5" green-yellow elongated fruit that eventually turn brown to nearly black when ripe. It is reported to have a banana custard-like flavor, some say that fully ripe fruit of the Dwarf Pawpaw is equal to the Pawpaw, while others firmly disagree. 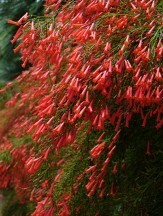 Produces small maroon to greenish flowers flowers in spring. 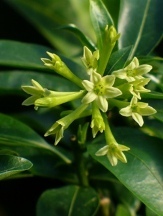 A small to medium-sized, spreading to upright, moderately slow growing, native deciduous shrub. A caterpillar host plant of the Zebra Swallowtail Butterfly. Seedling grown. Plant two for pollination. Item# 10232. 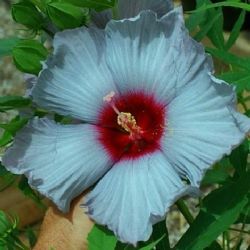 Glowing clear red 10" widely flaring flowers are born from summer to fall on this beautiful perennial Hibiscus. 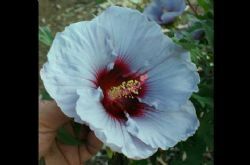 A compact habit and free flowering perennial Hibiscus with fine textured red or purple tinged foliage. A showstopper! Images courtesy of North Creek Nurseries. Item# 9914. 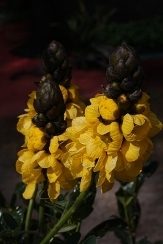 1" wide dark maroon pipe-like flowers are edged and veined in soft yellow and are edged in a loose yellow fringe and are borne from spring to fall. The 2-3" wide rounded to heart shaped foliage is accented by white veins and is used by the Pipevine Swallowtail as a host plant. 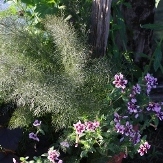 Use Fringed Dutchman's Pipevine as a hardy deciduous groundcover, allow it to spill from containers, or in hanging baskets to better display the unusual flowers. Item# 9681.